Comfort Sleeper® by American Leather® is quite simply the most comfortable AND most versatile sleeper sofa available. With 14 styles available, from transitional to modern, you’re sure to find the stylish centerpiece you want — with a better night’s sleep built right in. Every Comfort Sleeper® style has matching pieces available – sectionals, sofas, loveseats, chairs and ottomans – to complete your room, your way. 14 styles, 7 sizes, 3 mattress options, and hundreds of fabrics and leathers. 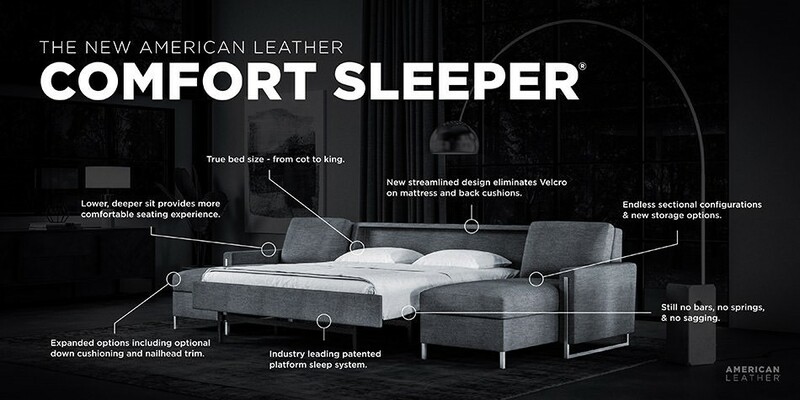 When it comes to our products, we promise craftsmanship and comfort in equal, elevated measures and Comfort Sleeper® by American Leather® is the utmost in style, comfort and functionality. Our patented Tiffany 24/7™ Sleep System lets you open and close your Comfort Sleeper® almost effortlessly, while a solid platform provides even support with no bars or painful springs in your back. The Comfort Sleeper® fits through hallways and doorways as narrow as 16" x 33".